A few years earlier, when we first launched Quix Joomla page builder, we got a huge positive response. Quix classic builder made its remark in the Joomla field. With new exciting elements, features, and support, ThemeXpert started a new journey which is very successful. But with the pace of time, it is really important to move on. Now Quix is built and redesigned in a new format. New elements, new features and lots of pre-made templates. With all the dedication of our designers & engineers, there are 60+ templates available in the library. 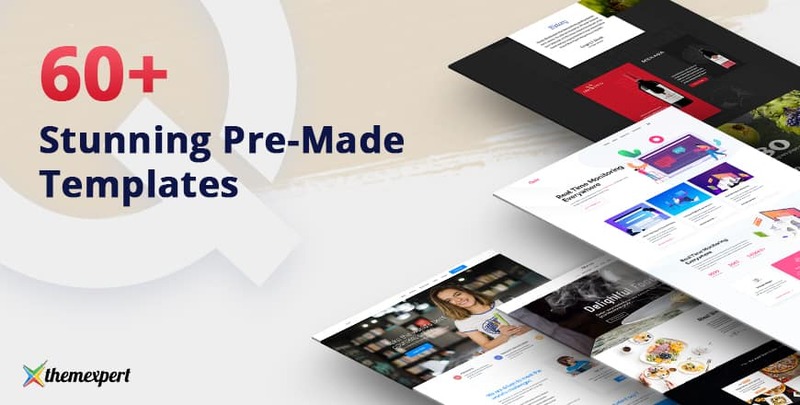 Today, we'll share the details of these templates, motivation, and reason behind building them and show you, how you can easily use them in your developing website. Template library is a library where built-in templates are available and you can use them whenever, wherever you want. Moreover, you can modify them in your own way, add dividers between different sections and make your website stunning. The template library even allows you to save your own creative section for reuse purpose. This will not only save your time but also your effort. Now you can easily design and develop beautiful websites in minutes that too effortlessly. You can not only insert sectional templates but also an entire page. Yes, our expert designers along with developers have provided some superb well-designed pages just for you. This will give you the idea of creatively designing a page and how to use them. And if you are a novice then this will work as a trump card for you. You can use them, edit them, change the sections of the page and set in the existing web pages. Quix is surely built in a professional manner but our team hasn't forgotten about the newbies in this field. The one who newly joins Joomla family may get confused on how to use it. But with our little help, we can turn a newbie into a professional developer. The purpose of the template library is to reduce your workload. Back in the days, it was a tough task to build a webpage in a day but not now with Quix Joomla page builder. Quix is designed flexibly and very much compatible with any framework. And to ease your daily workflow, our expert designers and developers have created readymade templates for you in the template library. You can make an entire page using relative sectional templates or just use an entre readymade page from the page tab provided in the template library. You can change the contents, add animations, change image and colors etc. Template library has its own benefits. This will give you a clear idea of why you should use it and how it will help you. We've listed them below. Using pre-made templates are very easy, you don't have to go through any kind of trouble. All you need to do is, open the library, select the template and insert it. And your selected template will appear in the specified section. All you need to do is edit and save. You can modify these template by changing the background, inserting a new element, adding new image, styling with entrance animation, and a lot more. You can save your designed templates right here and reuse them later in the same manner or by modifying it. Our expert developers and designers have designed some extraordinary templates that will blow your mind. You'll surely love them. You can use them as they are just by changing the content or by changing complete layout. Currently, there are 60+ template available for now. But we are working on it every single day and soon the number of templates will be increased. And once they're available, you'll find right in your Quix template library box. They'll be automatically included in your existing Quix version. Our plan with the template library is to expand it to a new level and include more relative templates and pages, so that you can make a complete website just by using them. This will give you new and creative ideas to turn the boring page format into a stunning one. Quix template library is available in the latest version of Quix Free and Pro version. All you need to do is, download Quix, install and use. Stay connected as more templates, elements, and features and on their way in the upcoming Quix versions. We always look forward to your comments, advice, and suggestions. Feel free to let us know how you feel about it in the comment box.